Photo Caption: H.E. Nahyan bin Mubarak Al Nahyan, UAE’s Minister of Culture, Youth, and Community Development and H.E. 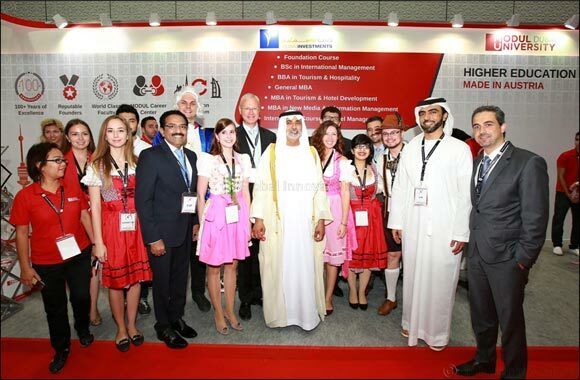 Mr. Peter Elsner-Mackay, Austria’s Ambassador to the UAE with Mr. Mohammed Al Raqbani, General Manager of Dubai Investments Industries and Mr. Zaid Maleh, Managing Director of MODUL University Dubai at the MODUL University stand at GETEX 2016. Dubai, UAE, June 1, 2016: MODUL University Dubai, a subsidiary of Dubai Investments Industries [DII], which is a wholly-owned subsidiary of Dubai Investments PJSC, and Austria’s leading international private university, is showcasing a wide array of academic programs and merit scholarships on offer for aspiring students at its campus in Dubai as part of its participation in the Gulf Education and Training Exhibition [GETEX] 2016. MODUL University, the first-of-its-kind university specialized in tourism and hospitality courses, is offering special promotional scholarships and packages for students during GETEX, which continues till April 15, 2016 at Dubai International Convention & Exhibition Centre. Over 35,000 local and expatriate students are expected to visit the exhibition scouting for higher education, professional development and training options. Tourism and hospitality contributed US$36.5bn to the UAE’s GDP in 2015 and is expected to reach US$65bn by 2026 while it’s the country’s largest employer with over 530,000 jobs. “This is where MODUL University Dubai comes to play a pivotal role” says Zaid Maleh, Managing Director of MODUL University Dubai. “We link our academic and vocational programs with the needs of the local market to ensure our graduates have the skills needed to succeed in an already growing sector” Maleh added. MODUL University Dubai is backed by 100-plus years’ legacy of MODUL College’s excellence in tourism and hospitality education worldwide. The courses on offer at MODUL University Dubai are accredited by the Knowledge and Human Development Authority [KHDA]. Short-term vocational programs and Foundation programs for undergraduates will also be offered at the university.